Upstart Loans Reviews - Is it a Scam or Legit? Modern science hasn’t brought us true artificial intelligence—yet, but it has brought us computer algorithms that can underwrite loans with a great deal of accuracy, faster and for less money than traditional methods. Because of this, a flood of software-based lenders have recently entered the market, promising to help with everything from home loans to student loan refinancing. One of these is Upstart Loans, a marketplace lender who claims to specialize in providing unsecured personal loans to those who are just starting their careers, and who might be short on work and credit history. But, by also looking at an applicant’s education and area of study (more about this soon), Upstart promises to deliver “fair and fast” loans at lower rates. Check your rate in 2 minutes (without affecting your credit score) by answering a few questions about your education and employment. Upon approval and acceptance of your loan, you’ll be able to get your money as soon as the next day. Set up automated payments until your loan is repaid in full. Together, this is why Upstart claims they’ve originated more than 32,000 loans to date. These seem like some impressive numbers, especially if you’re looking to make smart financial decisions, but don’t have the work history and credit score required for a traditional loan. Does this necessarily mean that Upstart Loans is right for you? Do you have other options? To gain a better understanding of what you’ll get with Upstart Loans, let’s take a look at how the company works. How Does Upstart Loans Work? For decades, most lenders have based an applicant’s creditworthiness on their FICO score and employment history. However, according to Upstart Loans’ co-founder Dave Girouard, the reality is that young people are less likely default on loans than some people twice their age. From there, Upstart’s algorithm develops a statistical model of the applicant’s financial capacity and personal propensity to repay. Then, it models 50,000+ scenarios in a few seconds, including “repayments, delinquencies and prepayments of every loan, month by month,” to determine the applicant’s likelihood of default and loan APR. According to Upstart, their model is continuously refined by comparing it to real-world results. To date, however, roughly 98% of all the company’s loans are current or paid in full. If you’re an investor (versus a borrower) Upstart also allows individuals to invest in the company’s loans, even through their IRAs. Upstart also claims P2P investors can assemble a portfolio of loans based on an applicant’s modeled likelihood of default,” depending on your risk and return criteria. Before moving on, let’s talk about some of the terms we’ve been using frequently. What’s the Difference Between Marketplace & Peer-to-Peer Lending? In practice, marketplace lending and peer-to-peer lending both reference the same thing; a company finds a qualified loan applicant, brings the applicant’s information to a peer (which could be an individual, a group of individuals, or other companies), who then provides the funds for these loans. Since these individuals or companies generally aren’t banks, they might not be subject to the same regulations and/or bureaucratic slowdowns. Although the concept of marketplace lending isn’t new, many recent P2P lenders have added proprietary algorithms to their arsenal that can underwrite a pre-approval in seconds. Taken together, this means that modern marketplace lenders can generally deliver faster approval times, broader underwriting criteria, and lower interest rates than traditional institutions. This is part of the reason why we’re seen a huge explosion in the number of marketplace lenders entering every aspect of the market recently, including CommonBond, LendingHome, SoFi, RapidLoansDirect, Headway Capital, and many others. Pro tip: As you can see, the marketplace lending industry covers a vast amount of territory; everything from personal lenders like Upstart to payday lenders. While personal loans can be a smart financial decision, most professionals recommend avoiding payday loans unless you have no other option. With this in mind, how much will you pay for an Upstart loan? How Much Does an Upstart Loan Cost? Upstart offers fixed loans from $1K to $50K, with 3 and 5-year repayment terms. APRs range between 4.66% and 29.99% APRs, depending on what you’ll be using your loan for (e.g. to pay off credit cards, consolidate debt, refinance student loans, etc.) as well as your underwriting criteria. Note: Upstart claims their average APR is 16% and average repayment term is 36 months. The only fees listed are a 1%-6% origination fee. For example: If you take out a $30K loan and have a 3% origination fee, you’ll be charged an extra $900. However, there are no prepayment penalties. Have questions? Upstart’s customer service department can be reached at 855-438-8778, via email at support@upstart.com, or through online chat. Will You Be Approved for an Upstart Loan? Since marketplace lending of this scale is a relatively recent phenomenon, there have been a few growing pains over the years. For example, the industry isn’t as tightly regulated as more traditional lenders, and these companies are still trying to find their comfortable niche. What we mean is that many of these companies (similar to Upstart) like to talk about helping younger clients, who perhaps don’t have the credit and/or employment history to obtain loans through banks. However, what they might gloss over is that you’ll still probably need a solid credit score and income level in order to qualify at a competitive APR. For example, according to Upstart’s own numbers, their clients have an average FICO score of 692 and an annual income of $99,720. On top of this, 90.9% are college graduates, and 78.4% use the funds to refinance credit cards. So, if you don’t have the employment and credit history necessary for traditional bank loans, but also lack a fairly high income and/or credit score, Upstart Loans might not be able to help out, either. What about Upstart’s real-world applicants? Have they been able to qualify? If so, did they find the process enjoyable? 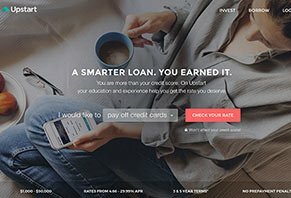 Are There Any Online Reviews for Upstart Loans? Pretty much wherever you look, Upstart Loans seems to come with positive feedback. For example, nearly 1,700 customers gave the company an average 4.7-star rating on CreditKarma, while 300+ gave Upstart an average rating of 9.2 on BestCompany. Common compliments seemed to reference a simple online application process, competitive rates, and responsive customer service. On the other hand, the most common complaints appeared to revolved around high origination fees (one claimed their origination fee increased their working APR by 4%), and high credit score and income requirements. Co-founded by ex-Googler Dave Girouard in 2014, Upstart Network, Inc. originally offered peer-to-peer loans that “enabled individuals to raise money by agreeing to share a percent of their future income” for a period of 5 or 10 years. Soon after in May 2014, this funding option was stopped. Today, along with co-founders Paul Gu and Anna M. Counselman, Upstart’s income prediction model has originated more than $420 million in loans across 33,000+ borrowers. All of Upstart’s loans are made by Cross River Bank, an FDIC insured New Jersey state chartered commercial bank. The company is backed by Google Ventures, Khosla Ventures, and many others, including Dallas Mavericks owner and Shark Tank star Mark Cuban. Is Upstart Loans the Right Marketplace Lender for You? Whether it’s individuals with lower credit scores or those with student loan debt, most P2P lenders have their own niche, as well as their own marketing angle. From Upstart’s perspective, it seems to be their fast approval and funding process, along with their focus on individuals with short income and credit histories. However, even after just a little bit of research, you’ll quickly find that Upstart isn’t necessarily unique in this aspect, and it all comes down to APR. And to find out the best one based on your specific criteria, you’ll need to pre-apply for rates. The good news is that, for the most part, this won’t affect your credit. Did you apply for an Upstart loan? Were you approved? What did you experience during the process? Tell the world about it in your very own review below! This company advertises through Credit Karma. You apply for a loan, get an approval email telling you funds will be deposited the next business day. You then take a short survey to ask how the process went (which you give 5 stars because it was so easy to apply for and get), and then you get a letter that it was denied. This company is doing bad business and finding ways to bump consumer ratings. If possible there would be no stars for this company. Yep...don't waste your time! After a process of stringing a customer along for almost a week with too many emails and personal information...then receive an offer by email...click in it and, oops, half an hour later told there has been a hard hit to my credit rating since applying. Loan approval denied...never applied anywhere else. This place is a joke! Had no issues with the application process, and got the amount I needed, an amount no bank or credit union would offer me. Interest rate was lower than any of my CCs, and I got the funds the next day. So far I have had no issues with them and forsee no problems in the future. My balance paid in full but credit agencies are still not updated. I called Upstart on the 14th and the 18th of December, 2017 and I told them after I paid my balance off and checked my credit report, that it's still showing I have an open balance with them. They told me they already sent the report to the credit agencies and there's nothing else they can do other than I have to file a dispute with the credit agencies. So once I paid off everything on the 18th of November, 2017, they just leave an open balance on my record and not even send me a statement of my balance is paid off. I just spoke to TransUnion and as of today, 12/18/2017, and they told me if my creditors would send them a report of the new status of my balance, they would immediately update their system. The problem is, Upstart Network Inc is not willing to correct the issue to fix the problem and send them the new report status until I file a dispute with the credit agencies! The dispute procedure can take up 30+ days according to TransUnion. I agree with all the bad reviews. I suggest you try a credit union. After jumping through hoops for several hours, I just withdrew my application. My credit union gave me a loan for the amount I requested in 10 minutes by giving them my info by phone. Upstart's advertising on how simple it is is not accurate. Other reviews I've read people tried for days and weeks to no avail. The interest rate they wanted to charge me was more than twice what my credit union charged. Then the ridiculous request. They wanted a certificate I earned in 1976 that I never used and was archived. That's when I told them to withdraw my app and not to contact me again. They are taking advantage of everyone and are no better than a title pawn company. I guess greed got them over. I applied for a $9,600 loan that was rejected, however, I received an email stating I was not qualified for the initial amount but was approved for a smaller loan amount. I sent in all the documents required, WHICH by the way seemed extreme and included some scary required documents. BUT I assumed I had already been approved (things like bank routing numbers were asked, voided checks, payroll to match bank statements). All were sent. The phone conversations had very strange questions. So after fulfilling all these requests, I sent an email stating I am done jumping through hoops, you have everything requested. Withing 5 minutes, they sent me a decline notice and the reason was too many inquiries on my credit. BULL CRAP reason. I then simply requested a credit increase from my bank and was approved in 20 minutes. I believe that Upstart isn't what they say and something very strange is going on there. If I could, I would rate zero stars. Bait and switch tactics, employees clearly don't know how to process loans or much less read a W2. I was offered a loan at almost 29%, then went to my local credit union and got one at 6%. Write a Review for Upstart Loans!